VoiceFM 89.9 News Artists News EKSG VS VOICE FM: OUR POSITION. Hi. I am Donald Falayi, General Manager of Voice 89.9 Fm, Ado-Ekiti. Let me use this medium to say happy new year to you our esteemed listeners, clients and well-wishers. Thank you for giving us the best possible start in 2017 when we commenced commercial broadcast. It was indeed a success and we’re extremely grateful for your support. We wish you a most prosperous 2018 while also calling for more patronage from you this year. Dear listener, the times are strange for us here at Voice FM because of the constant threat against our operations by proxies of government and faceless individuals. Almost from the start of operations in 2017, we have been receiving government memos stating against one issue or the other. One would think supplying such agencies with all relevant documents would be enough to halt all action against us but the reverse has proven to be the case. As we speak, a court process has even been instituted by government which we believe is part of moves to shut the station down. Again, there was the two cases in 2017 of security threat to the establishment, making our staff live constantly under the fear that something might happen to them anytime. The situation was not pretty at all. Now, when you put all these on top of the open call made by Mr Governor on television and radio calling on the people to boycott our services, our worst fear is confirmed. Our attention has been drawn to a publication dated 18th January supposedly a response to a purported earlier claim by Voice FM 89.9. To the best of my knowledge, no such official claim was ever made by anyone on the station’s staff or anyone contracted for such purpose by the station. In fact, this right here is the first and only official statement by this station. We would therefore be justified in describing this supposed claim a figment of the imagination of the writer. I am constrained to state clearly here what we feel has been a deliberate distortion of the facts of this matter which has invariably led to the need to urgently retrace the history of this issue for the benefit of the readers and listeners. 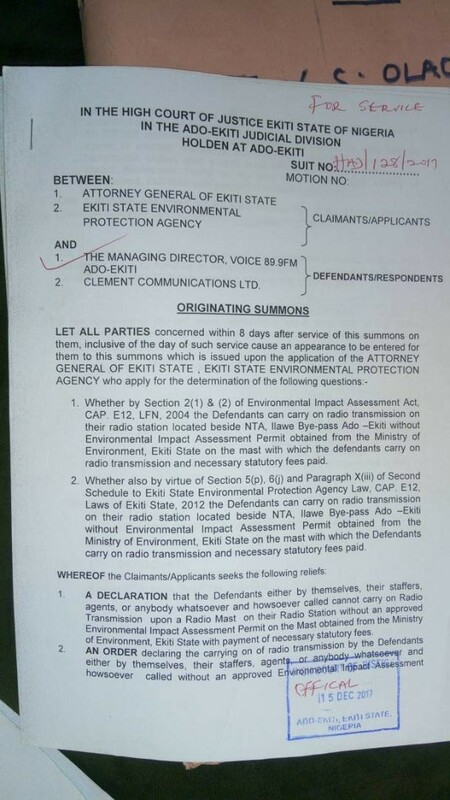 The Ekiti State Environmental Protection Agency memo quoted by the writer as EKSEPA/AD/VOL.II /59/71 was a request made to the developer of our radio mast to provide the necessary document for the construction. This was on 26th September 2016. Because of the delicate nature of said construction and the need to respect the law, a consultant was contracted to conduct an Environmental Impact Analysis Report that was submitted for approval to the Physical Planning Permit Agency of the Ministry of Lands, Housing and Urban Development . Approval was given on 22nd September 2016 that then made it possible to construct the radio tower, completing the project several months later without any further issues raised by the relevant government agencies. 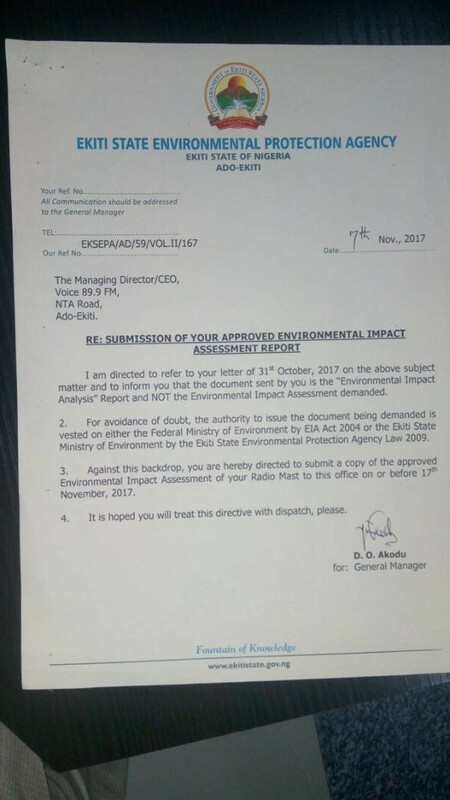 It was this same report that we made available to the Ekiti State Environmental Protection Agency following a request made by them dated 31st October 2017 with reference number: EKSEOA/AD/59/VOL.II?107. The document was received and the cover letter accompanying it was duly signed for by a receiving officer at the agency. 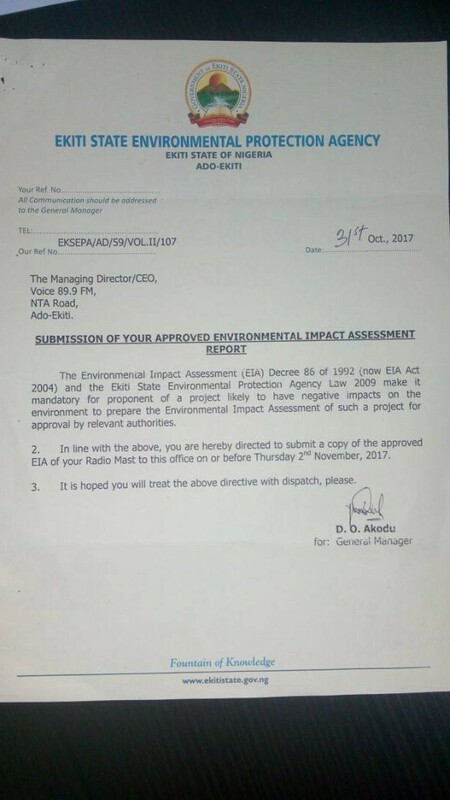 The distance of time between the approval of the Environmental Impact Assessment Report and the EKSEPA memo asking for a submission of same document is well over a year. So, one wonders how EKSEPA would have allowed the project to continue if there was some problem with the approved report or the construction of the radio tower. 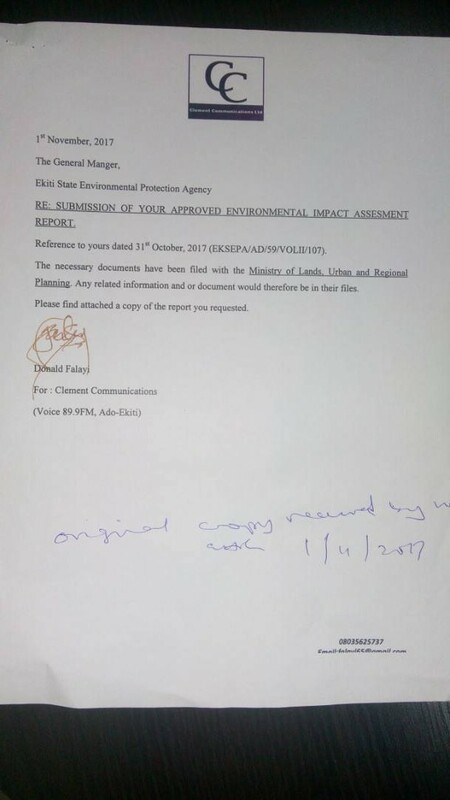 Another memo from EKSEPA arrived on 7th November 2017 with Ref No: EkSEPA/AD/59/VOL.II/167 at which point the station’s legal adviser Barr. 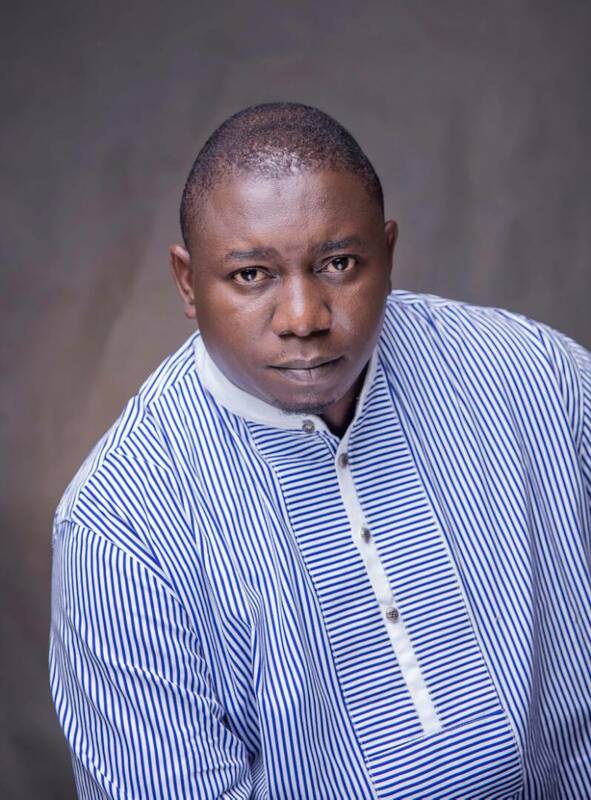 Olalekan Olatawura at the instance of the station, wrote a comprehensive response to the Permanent Secretary at the Ministry of Lands, Housing and Urban Development with the relevant documents on 29th November 2017. 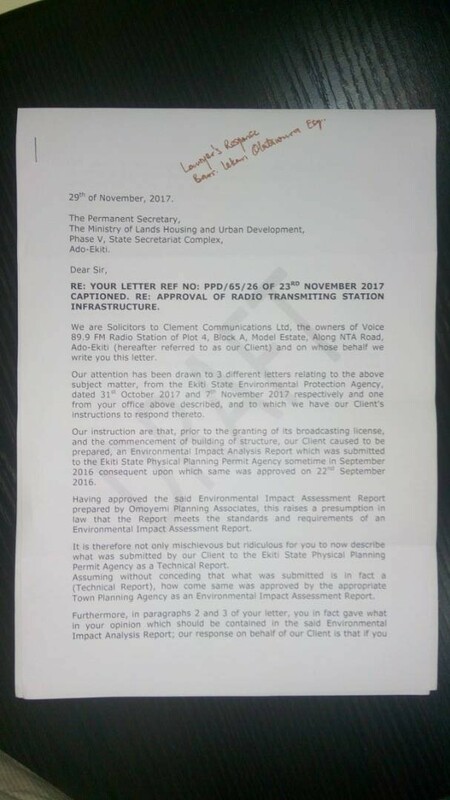 Therefore to claim in the Ministry of Environment’s supposed rebuttal that Voice FM ignored all its requests is morbidly unfair and a mischievous attempt at soiling the good name of the radio station. 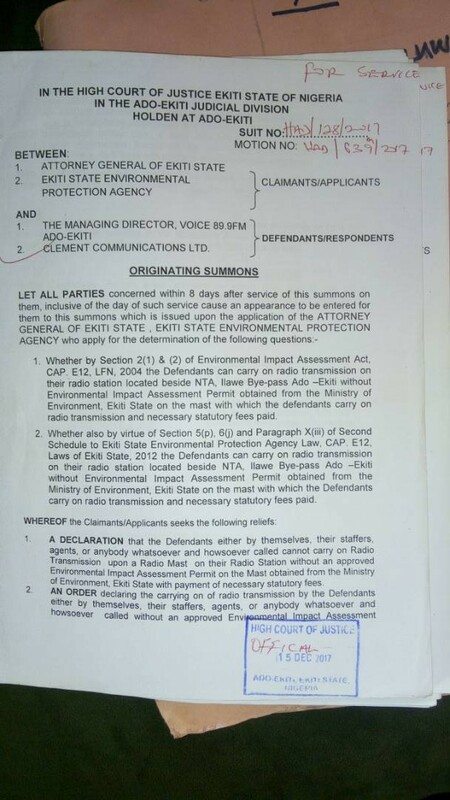 Voice89.9FM Ado-Ekiti is a law abiding corporate citizen of Ekiti State and therefore cannot be found wanting in the discharge of its duties and responsibilities to this state. For further evidence that what we are saying is true, you may wish to clarify by viewing scanned photos of said documents on our social media pages using the handle @ Voicefm899. What does the media mean to society? What purpose does radio serve in informing a society like ours? Why does Ogun have 16, Oyo 26, Ondo 13, Osun 10 and Lagos with over 30? Why is Ekiti in the bottom 4 nationwide with Yobe & Zamfara with One each while we share the 35th position with Kebbi State that has 3? Are we really that poor and under-developed as a State? Banks shut down branches all the time due to a variety of reasons. For them it’s no big deal, but guess for whom such closures are a huge deal….. the workers of course! They get laid off. If this push against the station succeeds and God forbid the station shuts down, we all here lose our jobs because no private employer would keep and continue topay staff that are not working for him. It is business 101! I am from Ekiti and so are the majority of my staff. If we lose our jobs due to this issue, we all join the already over populated unemployment rank and file. So yes, this is a matter of life or death! Business in the larger social sense is like a sub-structure on which all other economic structures rest. It is the very food that feeds society fat. It provides opportunities for people especially young people to live by. Through incomes earned from jobs in such ventures, society survives. Now, let’s use an example closer to home: Why does Ekiti have such a huge number of unemployed youths parading its streets with no hope or future? The answer is simple Oodua Textile Mills is gone; Ire Burnt Bricks factory in a coma, government jobs virtually non-existent due to poor payment of salaries; almost zero mechanized agricultural activities across the state and now Ekiti is even consuming Ofada rice rather than the Igbemo rice we were known for! In my candid opinion, now is the time to go out of the way to encourage massive investments across Ekiti. We hope that what we have done as a broadcaster these past six months prove to all and sundry that we are here to add value to Ekiti as a radio station that truly is truly an unbiased voice of the people. Let me use this opportunity again to call on organizations and individuals that are still hesitant in doing business with us or those that may have been scared off by warnings on a sister radio and television station that this radio station is meant to facilitate inclusion for all without excluding anyone on account of religion, race, language or political affiliation. If you have a point to make and you can do so without being abusive, then our airwave is yours. It was our business model from day one and that is not going to change. Finally, this is a plea. 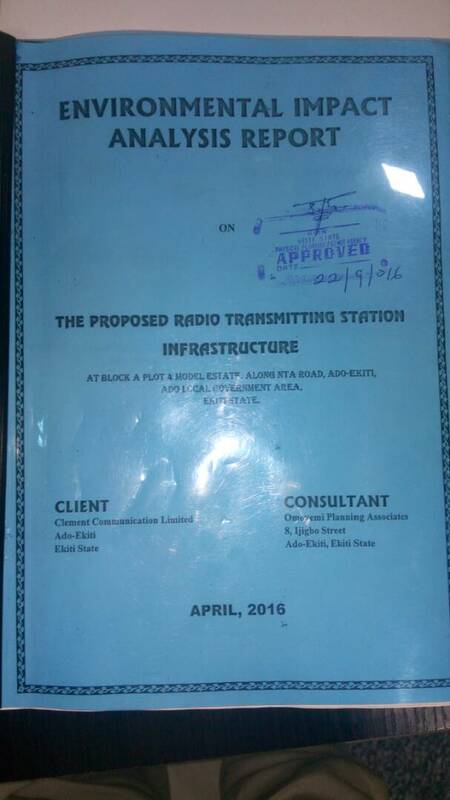 A plea to the authorities and highly placed individuals in Ekiti to please use all their powers to make this station survive and succeed. 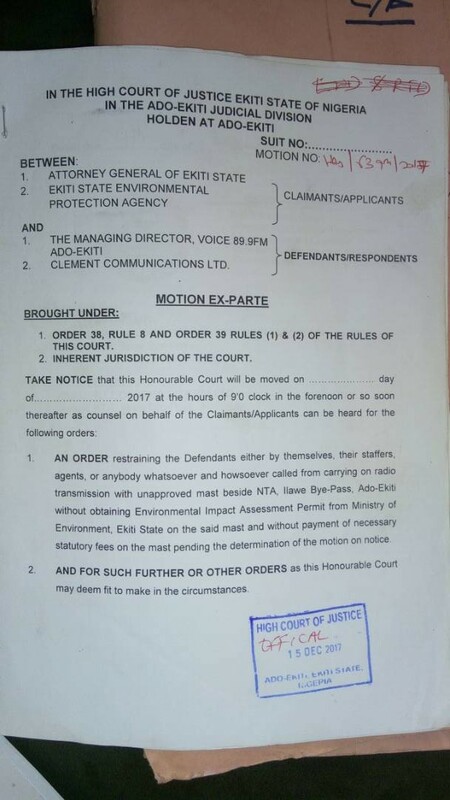 For as far as we know and through more experienced corporate players in the broadcasting industry that we have had to consult in the course of this matter, we are convinced that we have satisfied all statutory requirements that qualifies us to operate as a radio station in Ekiti state duly licensed by the National Broadcasting Commission. 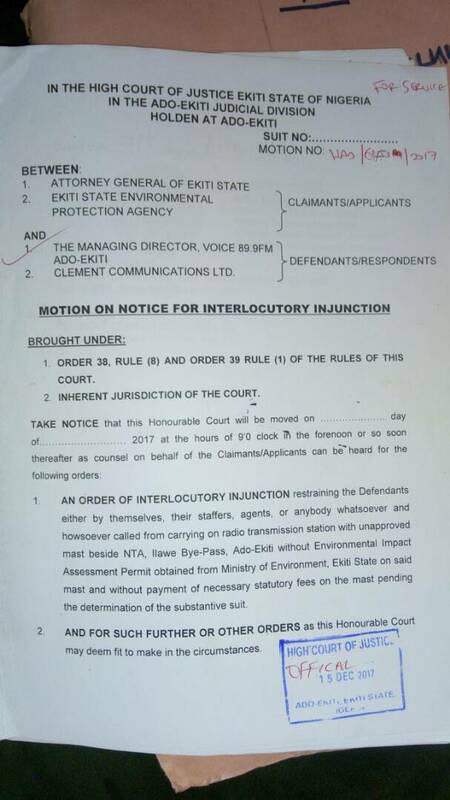 Any attempt to silence Voice fm the first private radio station in Ekiti will be damaging to any future plan to industrialize this State. No one would bring money here to invest. This is our plea on behalf of the Ekiti Youths who work here, part of the larger body of Ekiti youths whom we profess to plan for.